Depending on whom you talk to and the individual strength of that particular printer, you can get different answers as to what makes a really great catalog printing. Advantage, The Dingley Press. Here, it’s all of the above, and then some, on runs of 100,000 to 10 million catalogs. Plus, you have a wide variety of options in substrates and basis weights ranging from light weight uncoated stocks all the way to the finest #2 and #3 stocks. It‘s a given that you don’t print great catalogs without modern high-speed offset/heatset web presses with all the hi-tech sophistication. We have that covered. 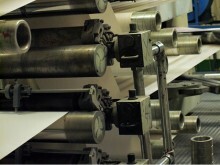 But for the standard of quality that we provide, the press is only part of the equation. The talent and attention of the press operator(s) will always be a game changer. Our master operators have created a standard of QC they like to call DingleyControl.